A team of 17 cyclists has completed a 60 mile cycle trial through Cumbria to raise money for the Great North Air Ambulance. 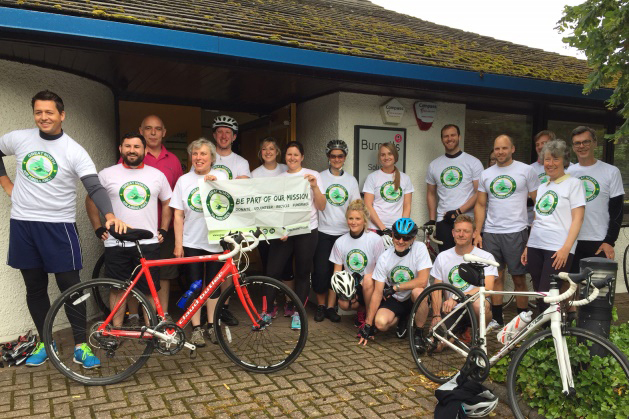 The challenge on Friday 14th July 2017 was hosted by law firm Burnetts and saw a team of lawyers ride through the County on a cycle tour of the firm’s offices in Cockermouth, Penrith and Carlisle. Burnetts’ team was joined by friends and family from CN Group, Carlisle Brass, Gaynham King & Mellor and PPM Ltd. The challenge was organised by Trainee Solicitor Georgina Farrer, 28, with support from Phil Rigby, Picture Editor at CN Group who planned the 60 mile route which included a punishing 260m climb over Whinlatter, followed by demanding ascents at Troutbeck and Wayside Terrace. The team set off from Cockermouth office at 9.00am, cheered on by staff from Burnetts’ Cockermouth office. They arrived at Penrith at 12.30pm to enjoy a lunch prepared by colleagues. By 4.00pm, the team had completed their challenge and arrived at Burnetts’ Victoria Place head office in Carlisle, to be welcomed by staff and partners with a champagne reception. Taking part in the challenge from Burnetts were: Robbie Mather, Daniel Addis, Megan Richardson, Georgina Farrer, Natalie Clifford, Debra Robinson, David Tew, Patricia Hall, Lisa Vevers, and Sally Johnson. The cycle challenge is one of a number of fund-raising events Burnetts is organising as part of its commitment to raise £10,000 for the Great North Air Ambulance, the firm’s 2017 Charity of the Year. The next event is an Inter Professionals Charity Golf Day on 22nd August. To donate to the cycle challenge team, go to https://www.justgiving.com/fundraising/B2B-Cycle-Ride or visit www.burnetts.co.uk/ipg to find out more about the Charity Golf Day.